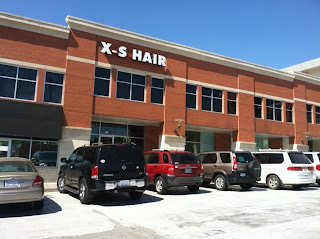 While I'm sure that's a super clever play on words about a hair cuttery, it total just makes me think of "X-S" hair in really unwanted places. Like ears, upper lips, arms, etc. You get the idea. That's a swing and a miss on the name, X-S Hair. But on the bright side, it appears they must be doing well, what with a full parking lot and what appears to be zero other tenants in the building. Perhaps this sort of word trickery appeals to the masses more than to the Marilyn.